The social media upstart's 150-day lock up period expires, which means a flood of shares could be hitting the market beginning on Monday. The lockup comes amid broader anxiety about Snap's future growth, profitability and rivalry with Facebook Inc.'s (FB - Get Report) Instagram. 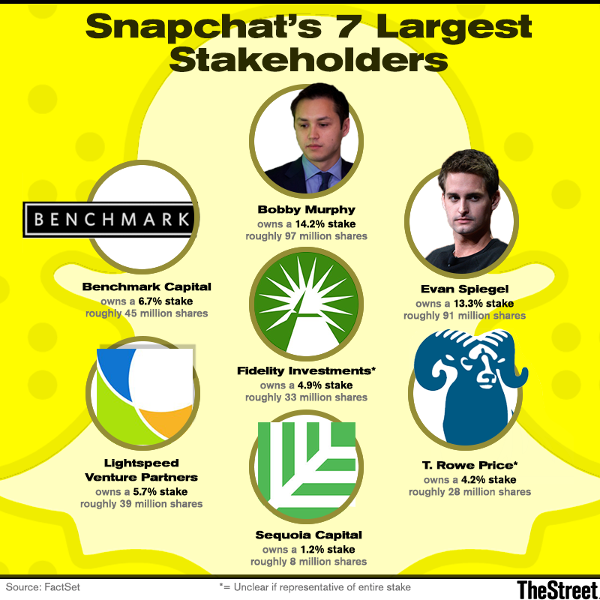 Some of Snap's most bullish supporters have expressed waning confidence (including lead underwriters Cowen and Morgan Stanley) about its ability to live up to its massive valuation, as well as expectations for it to be a high-growth company. Snap will also be in focus when it reports its latest quarterly earnings on Aug. 10. Wall Street is expecting Snap's top and bottom line to increase quarter-over-quarter and for it to post a sequential increase in daily active users; in its first quarter as a public company, it posted a massive $2.2 billion loss. Until its next report, however, most investors eyes are fixed on what the outcome of the lockup expiration will be. A 2001 study from researchers at Penn State University found that, based on a survey of 1,948 share lockup agreements between 1988 and 1997, the average stock fell about 2% around the time of the lockup expiration. Snap will likely see a downward swing in its stock price, but the move may prove to be more muted as there has been extensive publicity about its impending lockup, said Kathleen Smith, manager of IPO-focused exchange-traded funds at Renaissance Capital. "The anticipation of the lockup period has pushed the stock down a lot," Smith explained. There are also some factors concerning Snap that could make its lockup worse than others in the past, however. It's a bad sign when there are a larger-than-usual amount of shares relative to a stock's tradable float, Smith noted. Snap's lockup expiration is a little more than six times its tradable float, she said. Other concerns surround the fact that global index provider FTSE Russell announced on Wednesday that it would begin requiring companies on its indexes to have a minimum of 5% voting rights in the hands of public shareholders. This means that Snap will be excluded from the index due to its unusual non-voting share structure. Being included on major indexes is viewed as a key milestone for young companies, as it makes their stock required to be owned by passive funds and other indexes, according to Reuters. Issues like this may take a while to materialize any impact on Snap, Smith said, but it's definitely viewed as a long-term negative. Snap's stock may also be in lower demand as investors remain wary about whether its high-flying valuation is justified, Smith noted. "Maybe we'll see a bit of relief between now and August 10th, but I think the stock is going to be in volatile territory until investors get a better idea of how to value this company," Smith added. All of these concerns have led many investors to short the stock leading up to the lockup expiration. Snap short interest -- or wagers against a company's stock price -- was about $1 billion as of July 24, according to short interest data firm S3 Partners. Short interest in Snap has been building over the last couple months. "With short interest increasing even at these expensive borrow rates, it looks like short sellers are positioning themselves for a dramatic selloff in Snap's stock price after the lockups expire," S3 wrote.